Start by making the ties. Sew along the long side, with right sides together. Curve your seam at one end, if you want, to give it a more finished look. Like this. Then trim. Turn them both right side out. Iron flat. Top-stitch really close to the edge, all the way around both ties. Next, fold over the long edges of your waistband, about 1/4 inch. Iron. Then fold over the ends a 1/4 inch and iron. Next, your going to sew around 3 edges of the main piece. The 2 sides (shorter sides) and the bottom (one of the longer sides). Turn under each edge a 1/4 inch, and then 1/4 inch again. Sew. See all 3 sides that are sewn? Next, lay your main piece right side up with the unfinished edge at the top. Align your waistband up at the top. And fold the other half of the waistband over the top. Pin in place and sew close to the bottom edge, leaving the 2 ends open. Next, your going to attach the 2 ties to each end. But first, you’ll need to fold each unfinished end just a little bit so that it will fit nicely into the opening. If you’d rather not do this, just make your strips 4 x 34 inches (instead of 4 x 35) and they should slide right in without folding. I just like the look of it. Then sew close to the edge to secure the ties in place. Cute, right? Lastly, the pocket. Fold over the top edge (one of the shorter ends) 1/4 inch with wrong sides together. Then flip that sewn edge back and fold over 1 inch with right side together. Sew along the edge, 1/4 seam allowance. Trim the corners. Then turn that section right side out. This is the top of your pocket. It makes it all nice and neat looking. Now fold the 2 sides in 1/4 inch and then fold the bottom up 1/4 inch. Iron into place. Now, sew around the sides and bottom of the pocket to secure it to the main section. Whew, done. It really is a quick project. I just took a lot of pictures because if you’re anything like me…….you might like to see every step. This is so cute! Thanks for the wonderful instructions! I can’t wait to make this!!! Love it. Now I just need to get my sewing machine fixed. very cute–i was wondering where you get all your adorable fabrics? a local store or online? i’ve been ordering online lately so i was wondering what sites or stores you would recommend? SUPER CUTE!!! im so going to make this soon! im 5’2″ and when i do dishes, it hits my belly button so my stomach gets wet and looks really weird… yeah.. not flattering! Thanks for posting these instructions. I’m excited to try and make one! I’m so glad the pictures are helpful. Where do you get all your cute, cute fabric? It’s so darling! Thanks for sharing all your great ideas! I l-o-v-e your blog and am so grateful I came across it! I’ve learned so much from you! WOW! This went together so much faster then I thought it would. I did three of them during nap time yesterday and they all look so cute! I made these for Thanksgiving. I sewed 3 for me and my sisters. We can look very fashionable and be busy at the same time. THank you for the pattern. I was fun!! I'm loving this idea! I like my full apron for the kitchen, since if I'm doing something that needs an apron, it's usually REALLY messy… but this would be great for crafting and having some supplies on hand. And I bet it wouldn't be hard at all to add a few pockets. This is GREAT! I'm just starting out with sewing, and picked up the perfect fabric for this project this morning. I love the step by step photos, it's going to make it so much easier for me. 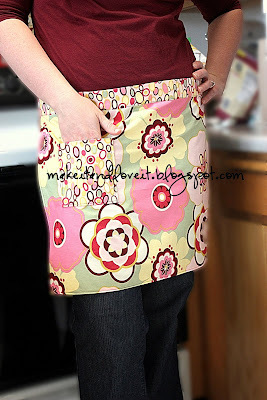 Very cute, easy apron! And I used those exact fabrics for my daughters' room! Curtains, play table covers, dust ruffles, and changing pad cover. I made it and I love it! It was the first apron I’ve ever attempted. See the photo here. Great project and easy-to-follow instructions. THank you! The apron turned out great! Thanks for sharing this project! I am having difficulty turning the ties right side out. I know how to turn a tube but this one is closed at one end…any tips? Really cute and easy. I teach sewing classes and might use this idea:) I did wonder if you meant to ‘take the inch off’ the width of the tie measurement instead of the length for those wanting the tie to fit in band without ‘folding’. No big deal, I was just trying to picture how the other way would make a difference. Good work. Thanks for sharing!